Lemons add acid, which can heighten other flavors, and a bright, tangy flavor to foods. Lemons are full of vitamin C, folate, fiber, and potassium. See how to choose the best lemons and how to use them below. Almost all lemons sold in North America are either Eureka or Lisbon. These lemons are so similar - medium-sized, oval, bright yellow inside and out, with a tangy and bright flavor - that they are grown and packed together. A much smaller Meyer lemon crop comes ​from California, Arizona, and Florida. Meyer lemons are sweeter than regular lemons, with an orange-like flavor and aroma. 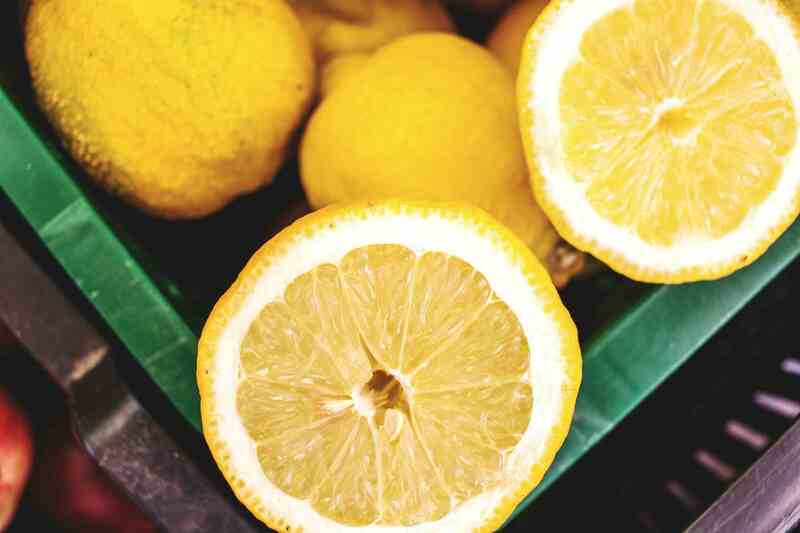 Unlike other citrus, lemons don't need a ton of heat to ripen. They also bloom and ripe concurrently - that is, they'll have blossoms and fruit on the same tree at the same time. Trees in particularly temperate areas can have fruit ripening year-round (or almost). Commercial trees, however, tend to be harvest 3 or 4 times in their season, which is about 6 months long. Most lemons (95%) grown in the U.S. are from California and Arizona, with coastal California groves harvesting in late winter through early summer and Arizona groves harvesting in fall and early winter. As with all fruits, look for lemons that feel heavy for their size. Also, the old wives' tale is true: smaller citrus fruit is juicier. As luck would have it, our bigger-is-better culture has made smaller citrus fruit cheaper, too. Look for small, heavy fruit without bruises, cuts, or blemishes that will lead it to rot or mold quickly. Lemons will be juiciest when stored at room temperature—just in a bowl on the counter works great. They will keep longer, though, if stored loosely wrapped in plastic in the crisper drawer in the fridge. Lemon juice is the common way to use lemons. When most people think of using lemons they think of lemon juice. And lemon juice has endless uses. But lemons are also a whole fruit. Not one, perhaps, most of us would consider eating out-of-hand, but a whole fruit nonetheless. Lemon sections can be great in otherwise sweet salads, and preserved lemons are softened and mellowed by a long soak in salty lemon juice, rendering their peel not just edible, but delicious. Plus, lemons can be used as an all-natural, non-toxic cleaner, softener, and deodorizer. The juice sacs in the lemons will burst if you freeze the fruits whole. Luckily, if you're willing to separate lemons into their juice and their zest, they freeze beautifully. Lemon juice freezes very nicely indeed. So feel free to juice lemons and freeze the juice - in quarts, cups, or ice cubes, whatever amount works best for you. Lemon zest - the bright yellow part of the peel (never include the bitter white pith beneath)- also freezes very well. Grate it off of lemons before you juice them, freeze it in a small resealable plastic bag, and use in teaspoon portions to add to salad dressings, soups, or roasts.